December 27, 2008 by rwb, under Microcontroller. It’s interesting to explore what we can do with this tiny 8 pins; 8-bit microcontroller. The ATtiny13 is the smallest and cheapest Atmel AVR 8-bit microcontroller families but yet, it’s loaded with sophisticated peripherals such as two 8-bit PWM channels and 4 channels 10-bit ADC. Although the memory is quite small; 1 K flash, 64 SRAM and 64 EEPROM but this more the adequate for most PWM and ADC application, if you need more memory, bellow is the list of other Atmel AVR 8 pins microcontrollers which have compatible pins with ATtiny13 microcontroller. The 10K trimpot is used as an input for ADC which connected to the ADC1 input on the ATtiny13 (PIN 7) and to make it little bit more interesting I added the switch (S1) for switching the fan on/off and LED for the program life beacon, this LED will blink according to the PWM value passed to the fan, if the fan rotate faster the LED will blink slowly, but when the fan rotate slower the LED will blink faster. 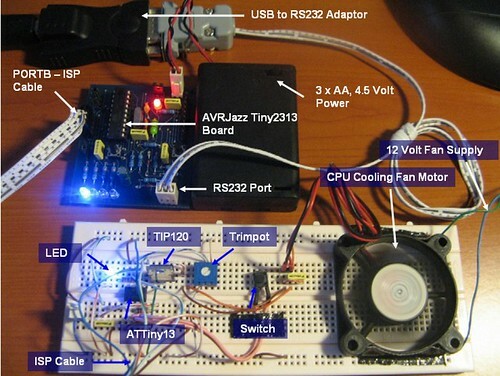 The fan speed is controlled by the trimpot which works as a voltage divider that supply the variable voltage to the ATtiny13 analog input. Prescale device is used to prescale the clock frequency (internal or external) and this clock is used by the successive approximation circuitry inside the ADC peripheral to convert the analog signal. To get the maximum resolution we could choose the frequency between 50 kHz to 200 kHz, in this project I use 64 prescale; therefore the frequency is about 150 kHz (9600000 Hz / 64). When the ADC peripheral finish converting, it will place the result in ADC data register pairs ADCH and ADCL; because in this project we just use the 8-bit conversion, we set to left adjust the ADC result by setting the bit ADLAR to logical “1” in the ADMUX register and read the result only in the ADCH register (we just ignore the LSB bits in the ADCL register). The ATtiny13 microcontroller support two types of PWM mode; first is the fast PWM mode which is provide high frequency output, the second one is the phase correct PWM mode which is base on dual slope counter operation; this type of PWM mode has lower frequency output comparing to the fast PWM mode. In this project we will use the fast PWM mode. By setting the COM0A1=1 and COM0A0=0, we choose the clear OC0A on compare match, set OC0A on top. This mean when the TCNT0 counter register equal to the OCR0A register value then the output of OC0A (PB0) will be logical “0” and when the TCNT0 reach the maximum value (255) then the output of OC0A will be logical “1“. 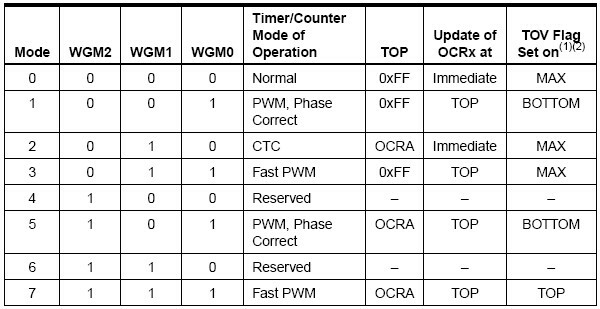 The fast PWM mode could be choose by setting the WGM2=0 bit in TCCR0B register, WGM1=1 and WGM2=1 bits in TCCR0A register. The heart of PWM peripheral lays in the 8-bit timer/counter, when we start the counter the wave generation form circuit will continue comparing the TCNT0 counter register value with the OCR0A register value and generating the output base on this comparison result. In order to activate the counter we need to supply the clock to the counter which can be choose from the prescaler device inside the timer/counter peripheral. You should experiment with your own prescaler factor which is depends on the DC motor you use. Try to start with big prescaler first and slowly decrease it and see how your DC motor response. The force output compare bits FOC0A and FOC0B in register TCCR0B is set to logical “0” in PWM mode. Inside this endless loop we do the switch reading, PWM enable and disable, ADC conversion, LED on and off. As I explained before, I use LED indicator for the program life beacon; but to make it interest I put the ADC result value as the delay parameter for the delay function, this make the delay times varied as we adjust the trimpot. When the ADCH value is high means the PWM high pulse (logical “1“) output generated by the waveform generator on the OC0A (PB0) port will be wider this mean the DC motor will turn faster, while the LED delay times will be longer; when the ADCH value is low means the PWM high pulse will be sorter and the DC motor will turn slower but the LED delay times will be sorter. You can change this behavior by changing the COM0A1 and COM0A0 bits setting in the TCCR0A register, this will change the OC0A output. Make sure you choose the Int. RC Osc. 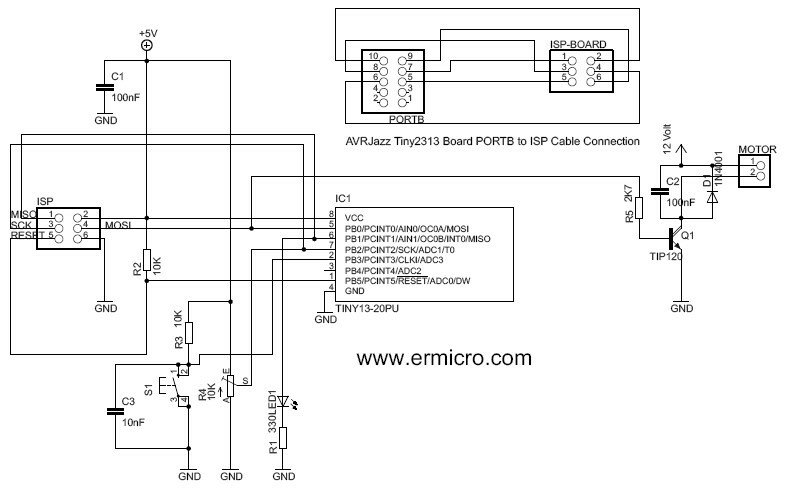 9.6Mhz; Start-up time: 14 CK + 64ms, after verifying it you are ready to down load the code to the ATtiny13 microcontroller. Notes: when the fan turn slower, the LED blink faster but when captured in the video it appear to blink slower because the blinking is very fast. For controlling direction of the motor a bridge driver must be used, for example L298.